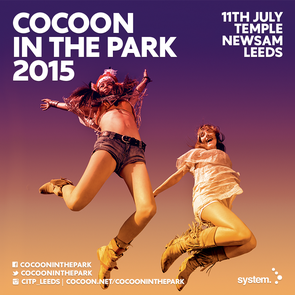 The seventh year of Cocoon In The Park featuring Sven Väth, Carl Cox, Ricardo Villalobos, Dixon, Enzo Siragusa and Seb Zito will take place on 11 July 2015. Temple Newsam will be the home once again this year, with its natural amphitheatre focused on the one enormous stage surrounded by trees and rich green Yorkshire countryside. On stage, Enzo Siragusa returns after his performance in 2014, however this time back to back with fellow Fuse member Seb Zito. Special guest, Dixon will make his Cocoon In The Park debut, which for the first time, also welcomes Carl Cox. Also playing is Ricardo Villalobos and closing the show as ever is Sven Väth. Sound is by Funktion-One, supplied by Audio-Plus, visuals and pyrotechnics are promised to be special and the Cocoon dancers complete the extravaganza.